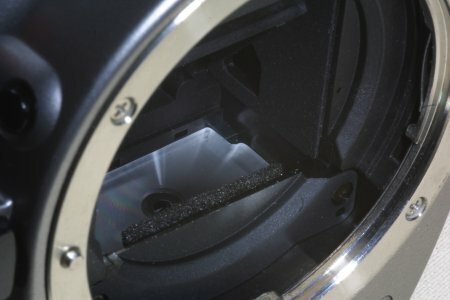 Canon, and other manufacturers, does not recommend changing the focusing screen. It may void the warranty on your camera. The instructions presented here may be obsolete at any time. I am not responsible for the outcome of your camera after following these instructions. The Haoda manual focus screen for the Digital Rebel did not include installation instruction upon arrival (see my "Haoda Focus Screen" review article). A mix of third party instructions is available for download from the Haoda Optical Research Group (see "Related links"). However, The instruction was written haphazardly, with so many style and grammar errors that it misinforms the reader. The out-dated picture doesn't help either. After staring at its pages for quite a few minutes, I was confused and frustrated. I decided to throw the instruction away and figure it out for myself. After working it out for myself, the original instruction made more sense. But it is definitely not written for someone who hasn't changed focusing screens before. Digital Rebel, 300D, and Kiss Digital are all the same camera, if you don't already know. Kiss Digital is the marketing name in Japan, 300D in Europe, and Digital Rebel in North America. I think the Haoda focusing screen is a great product; a product that fills a market that Canon ignored. I'd hate to see bad instructions turning people away. Thus, I decided to write my own how-to install instruction. What follows are step-by-step instructions to remove and install the focusing screen into the Digital Rebel. After the instructions, I documented my observations and whether the same focus screen will fit into other EOS digital and film cameras. The results may surprise you. This phrase is the scariest step for most photographers. For one thing, EOS photographers are led to believe that the focusing screen on the low-end SLR cameras is not interchangeable. In a way, this belief is true, but not for the reason you think. 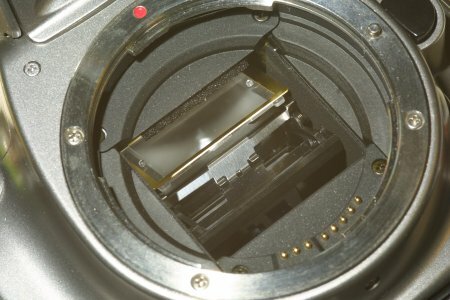 It is true because Canon does not make any additional focusing screen for its low-end EOS cameras, not because the focusing screen is hard or impossible to remove. In fact, it is rather easy. Another thing that scares most photographers away is that Canon strongly recommends changing the focusing screen of high-end EOS SLR cameras at the Canon Official Service Center. Changing the screen, yourself, can void the warranty. Who wouldn't be afraid? You are going into the delicate territory of the mirror, the focusing screen, the pentaprism, and the shutter leaves. Just thinking about these components scares yon and me to death. That is until you've done it before. So I will step you through it. Remove the lens and place the camera body upside-down on a firm but soft surface. I used an ironing board on a table, but some old rags or a desk will do. 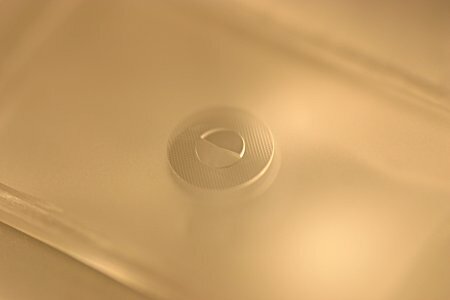 A thin metal bracket holds down the focusing screen in the mirror box. The bracket has a small tab at the front of the mirror box, by the mirror damping foam (see picture above). Use the sharp tip of a Xacto knife to poke through the center hole on the tab. You should be very careful with the sharp knife. Keep it away form the mirror and the focusing screen. If you have shaky hands, then you should not perform this task. Take it to a Canon service center, instead. Once the knife tip is securely in the hole, push the tab softly (a tiny force will do) into the mirror box and lift up the bracket (see picture below). The focusing screen is underneath the bracket. I used the Xacto Knife to lift the focusing screen up by its edge. Be sure to use the dull or the flat side to avoid cutting into the focusing screen. When it is lifted, I tilted the camera body to dump the screen out onto the soft surface. 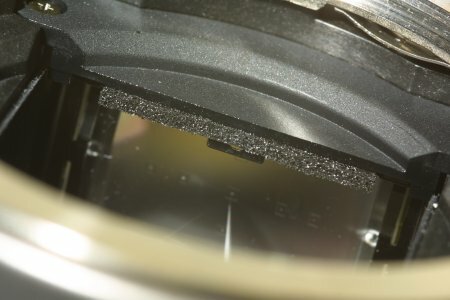 A copper shim is underneath the focusing screen. Use the same technique to remove it. 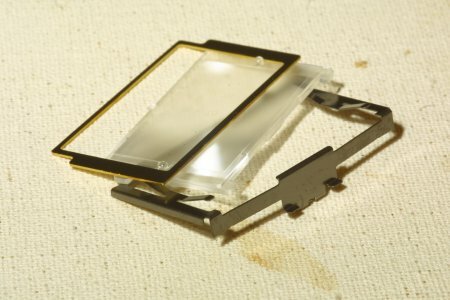 The picture below shows all three pieces (metal bracket, focusing screen, and copper shim) resting on the mirror. 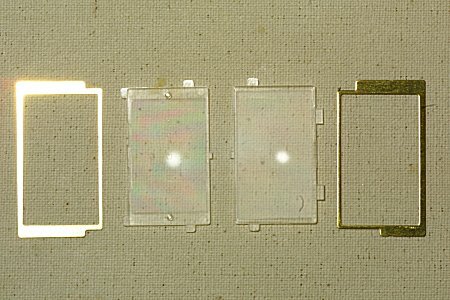 If you ever want to return your Digital Rebel back to the original condition, the following close-up picture shows all three pieces in the correct order and orientation. Notice the notches on both sides of the copper shim. Notice the tabs and pins on the AF screen. The following picture shows the three pieces, laid out, so that you can see their shapes clearly. 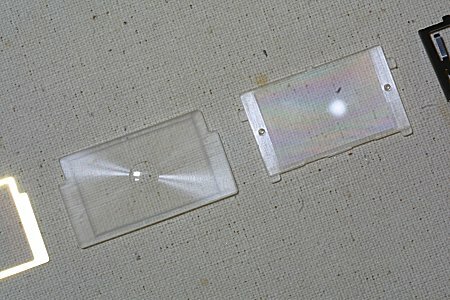 Haoda's manual focusing screen looks different than the EOS AF screen in your camera. There is no AF marks on the screen, but a split circle in the middle, surrounded by a ring field of microprism, surrounded by faint circular ring lines. The Haoda manual focusing screen does not have little tiny tabs (such as the ones on the AF screen) to align placement in the mirror box. Like the AF focusing screen, one side of Haoda's screen is matte flat while the other side is smooth gloss. The following picture shows the Haoda manual focus screen and the Digital Rebel AF screen side-by-side in the same installation orientation (matte surface up). When installing the Haoda manual focusing screen into the Digital Rebel, you won't need to reinstall the copper shim. The Haoda manual focusing screen has already accommodated the extra thickness. The picture below shows that the Haoda manual focusing screen is slightly thicker than the Digital Rebel AF screen. With the camera body upside-down on the soft surface, slid the Haoda manual focusing screen into the mirror box, over the pentamirror. The matte surface should be toward the pentamirror, while the glossy surface should be facing the outside. The two notches are in toward the back of the mirror box (see picture below). Slide the metal bracket back into the mirror box. Use the Xacto knife tip in the metal tab again and push the tab in. When the tab clears the damping foam, push the bracket down to secure the focusing screen. Don't pinch the damping foam. Now, you are done and ready to use the focusing screen, put the lens back on the camera and look through the viewfinder. You'll have a fresh new look in your viewfinder. It turned out that the shape of the Digital Rebel focus Screen is virtually identical to the D30 focus screen (see picture below). 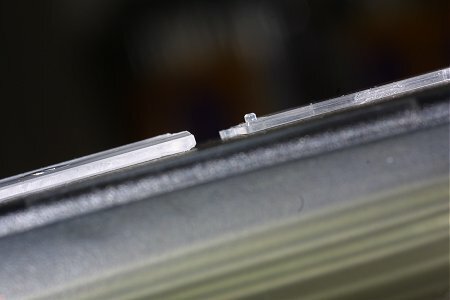 The two tabs, closer to the damping foam when installed in the mirror box, are in different positions. And, of course, the D30 focus screen has 3 AF marks while the Digital Rebel focus screen has 7 AF marks. There are also no round pins on the matte side of the D30 screen. One of the D30 notches are slightly longer, but it doesn't seem to make a big difference in installation. After installing Haoda's focus screen into the Digital Rebel, I took it back out and installed it into the D30. No modification required. The manual focus screen seems to work just fine in the D30. When I used AF to focus on an edge, the edge lined up perfectly on the Haoda focusing screen. "The thickness is nearly the same. The 300D screen is a little bit thicker. But most of the customers will not find it influential." The focus screen stayed in the D30 because I'm too lazy to take it back out. And I use the D30 just as much as the Digital Rebel; D30's faster shutter-lag/mirror-return response reduces the likelihood to shake. I have a Canon IX APS SLR camera sitting around. It's been collecting dust ever since I moved to digital. But it has always been one of my favorite cameras. I had actually sold my very first IX camera. I bought this one to complete my HDC book. Now it serves as an experimentation tool, such as what I'm about to tell you. 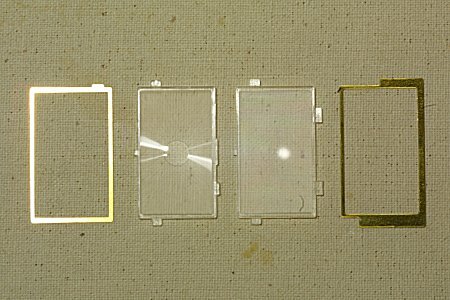 I pulled the focus screen out of the IX camera to compare with the D30 focus screen. It turned out that the physical shape and size of the focus screen from the EOS 1.6x digital SLR is the same as the focus screen from the EOS APS (1.25x) SLR Cameras. It's obvious that Canon did not want to redesign the focus screen for the smaller sensor. This is a similar situation to the 1.3x EOS cameras using the same interchangeable focus screen from full-frame sensor cameras. The alignment tabs are located at the same places on the D30 and the IX focus screen. However, the IX is missing one of the tabs. And the tab on the other side is a bit short than the tab on the D30. To install the D30 screen, one of the tabs has to be cut. The other has to be shaved or sanded slightly. 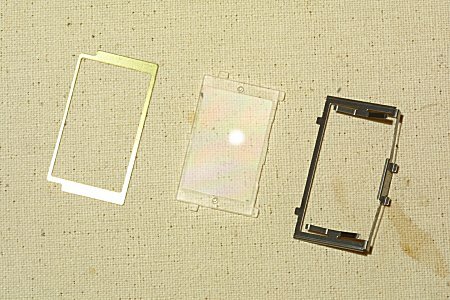 Will the Haoda manual focus screen fit without modification? No. But shaving the end slightly will work. However, I haven't tried it yet, so don't take my word for it just yet. Will the Haoda manual focus screen fit into a full-frame sensor EOS camera? No. The full-frame sensor screen is much bigger compared to the screen used in the 1.25x cameras. 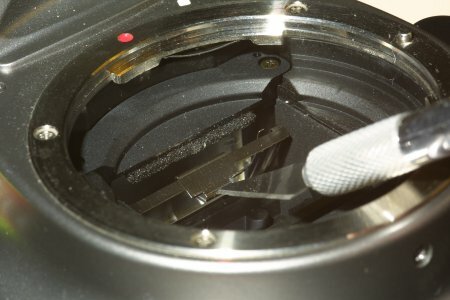 Installing a Canon EF-M split-circle viewfinder screen into an EOS camera.